I spent a number of hours researching a bug in a Model-Glue application. Each time a form was submitted successfully, a duplicate record showed up in the database. This application uses a number of frameworks and it wasn't very clear which layer was causing the problem. I started to dig into the issue, looking for any rhyme or reason and pinged my good buddy Ezra Parker for some sanity checks. After some intense debugging, we found out that the second record in the database showed up after the ColdFusion request ended. I tried all sorts of programmer sorcery to find out why this second request happened and did not get much useful information. This duplicate request problem defied all logic! Was Model-Glue possibly adding a second redirect somewhere? Was there a CFThread buried in Model-Glue, ColdSpring, Transfer or CFUniform that caused this? Were space hackers infiltrating my computer? Should I just quit programming and open a Bakery? I am one of those unlucky people who work from a home office. Most times I do not mind this as having the ability to control my environment makes me much more productive than being in an office. On most fronts, I like how things are. My office is in a loft in my house. Once I am up in the office, I am isolated from the rest of the house. I do not hear the doorbell, the house phone, or any other distraction. I've got all my tech books up there and all the right office equipment so things are pretty much how I want them. Pretty much. The one area I am not satisfied is in my computer management. 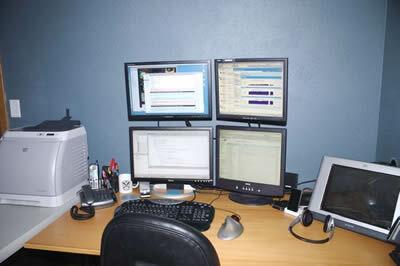 As you can see in the photo below, I have 2 desktops and 2 laptops managed through 3 monitors, 3 mice and 3 keyboards. What I don't have is enough desk space and I feel a little cramped. Before you ask, yes, I need all of those computers. 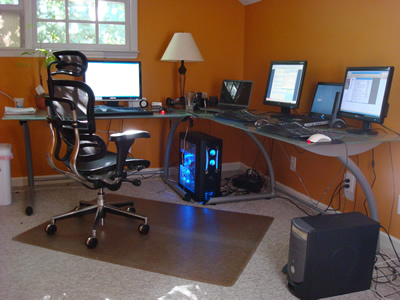 I don't, however think that the keyboards, mice and monitors are optimally set up and I do think there is room for improvement. 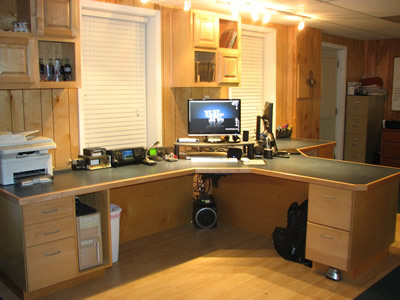 Since most of my readers are smarter than I, I'd like to ask how you have your office set up. 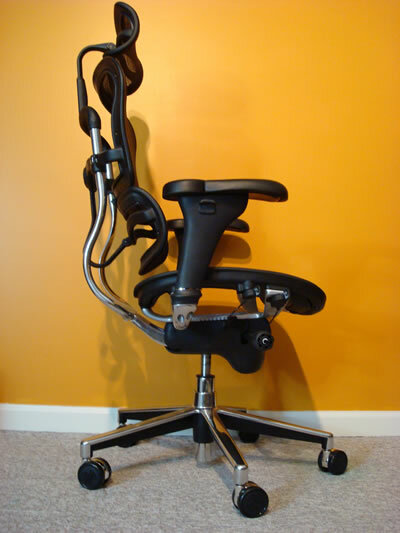 Do you think it is configured for maximum productivity? Why or why not? 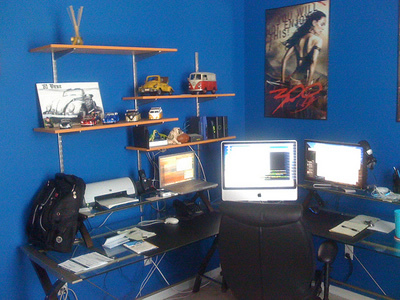 Feel free to email me your picture of your office setup. I'll post them here in this email along with your name.